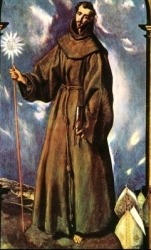 Franciscan Friar Minor. Priest. Itinerant preacher. Theological writer. His preaching skills were so great, and the conversions so numerous, that he has become associated with all areas of speaking, advertising, public relations, etc. Bernardino's charismatic preaching filled the plazas of Italian cities. Thousands of listeners flocked to hear him and to participate in dramatic rituals, which included collective weeping, bonfires of vanities, and exorcisms. He was a renowned peacemaker, in the Franciscan tradition, who tried to calm feuding clans and factions in the turbulent political world of the Renaissance. His preaching visits would often culminate in mass reconciliations, as listeners were persuaded to exchange the bacio di pace, or kiss of peace. Bernardino was sensitive to the demands of secular life, and tried to negotiate between Christian ethics and a conflicting code of honour that stressed retaining face in a public world. He argued that the catalyst of civil discord in the urban setting was malicious gossip, which led to insults, and, too often, vendetta by aggressive males. His surprising allies in his peacekeeping mission were the women who comprised the majority of his audience. Legend says that at her birth, angels gathered around Columba's house to sing. During her Baptism, a dove suddenly flew down to the font. From that point on, no one used her by her given name (Angelella = little angel), but called her Columba (= dove). She was raised in a poor but pious family; her parents gave away nearly everything thing they had to people even poorer than themselves. As a small girl Columba learned to spin and sew; she and her mother repaired the clothes of the local Dominicans. Educated by Dominican nuns. Columba quickly developed a strong devotion to Saint Catherine of Siena and to the Blessed Virgin Mary. While still in her teens she prayed about her vocation in life, and received a vision of Christ on a throne surrounded by saints. She took this as instruction to dedicate herself to God, and so she cut herself off from the world, made a private vow of chastity, and spent her time in prayer. Unbeknownst to Columba, her parents had arranged a marriage for her, but she cut off her hair and sent it to her would-be suitor, an accepted way at that time of telling him that she was devoting her life to God, not marriage. She had the gifts of prophecy, healing, exorcism, raising the dead, and miracles. Given to ecstacies during one of which her spirit toured the Holy Lands. Dominican tertiary at age 19. Her reputation for wisdom and holiness spread throughout the region, and she was a much sought after counsellor. Some people from the city of Narni, Italy tried to kidnap her so she could be their miracle worker, but she escaped. Following a revelation that she should leave Rieti, Italy, she walked away with no destination in mind. Along the way she was arrested in Foligno, Italy as a vagrant, but she eventually stopped and stayed in Perugia, Italy. On 1 January 1490 she and several other women took vows as a community of Dominican teritary nuns. Noted spiritual counselor to any who sought her advice. During an epidemic she worked among the sick, healing many by praying for them. She offered her own health in exchange for the city; when the general epidemic ended, she became ill, eventually recovering through the intercession of Saint Catherine of Siena. 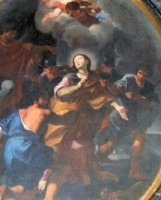 Her sanctity caused her to be persecuted by Lucrezia Borgia for years; at one point Borgia had a decree issued accusing Columba of practicing magic. Lay business woman in Thyatira, dealing in purple cloth, the most expensive type in the 1st century Middle East. Paul's first known convert. As a young adult, Arcangelo had an accident that left him with a lifelong limp. He entered the seminary in Brescia, Italy at age 18. Ordained in 1870, but illness forced him to spend his first year of priesthood with his family. Curate in the mountain village of Lodrino from 1871 to 1873. Curate at the Shrine of Santa Maria della Noce near Brescia. Noted for his attention to his parishioners, and his care for refugees. Curate at Botticino Sera in 1885; parish priest there in 1887, a post he held the rest of his life. He revitalized his parish, involved the parishioners, and made the church the center of the community. He founded the Workers' Mutual Aid Association, a form of social insurance for the sick, injured and aged. He used his own inheritance to build a modern spinning factory, employing local women, and using the profits to build a residence for them. He founded the Congregation of Worker Sisters of the Holy House of Nazareth who worked in factories with other women, teaching them when they could, and leading them by example. Father Arcangelo's strength came from prayer, much of it spent in front of the Blessed Sacrament. Born to immigrants from Spain, raised in a farm family, and known as a pious girl. Entered the Daughters of Our Lady of the Garden on 31 December 1915, taking her vows on 7 September 1918. Teacher and catechist to children. In 1924 to 1928 she was assigned to a tuberculosis hospital where she worked closely with sick children. When her own health began to suffer, she was assigned to a hospital in Vallenar, Chile where she was a source of joy, comfort and the teachings of God to many patients. Son of Ethelred, King of the East Angles, and Leofrana. A pious youth, he would have preferred religious life, but was in line for the throne. King of East Anglia for 44 years. He would have preferred to remain celibate, but agreed to seek the hand of Althryda (Alfrida) daughter of Offa, King of the Mercians in order to continue a stable line to the crown. There were a number of supernatural indications that it was a bad choice, but Ethelbert went anyway. Due to court intrigues, Ethelbert was murdered by a man named Grimbert at the instigation of his father-in-law, Offa of Mercia. Often listed as a martyr. Married lay evangelist who worked tirelessly to spread the faith in Gaul. He arrived Nîmes, France during a sacrifice to the Roman god Veiovis; he knocked over the statue, interrupted the sacrifice, preached against false gods, and was immediately seized, whipped and murdered. Martyr. Over 400 churches have been dedicated to him throughout France and Spain. Educated and trained as a courtier but felt a call to religious life. Monk in the abbey of Saint-Nizier at Lyons, France. Abbot of his house. Priest. Bishop of Bourges, France in 612. Physician. Imprisoned, tortured and martyred in the persecutions of Numerian. Married layman in the apostolic vicariate of Korea. At one point he abandoned Christianity, but recovered his faith, was imprisoned, tortured and eventually executed for refusing to renounce it again. Martyr. Killed for visiting Christian prisoners and giving them a decent burial after their execution. Martyr. Niece of the Emperor Gallienus. Adult convert to Christianity, baptised by Pope Saint Cornelius. She refused to marry a pagan patrician to whom she had arranged marriage and who required her to denouce her faith. Martyr. Mercedarian. While on a mission to Tunis, Tunisia to ransom Christian slaves from Muslim captors, he was imprisoned, tortured and left to die in prison with 30 fellow Christians. Martyr. Little known of his early life. Bishop of Pavia from 743 to 778. Outspoken critic of Arianism, which caused his repeated exile by Lombard Arian kings. Married to a former imperial proconsul. Mother of Flavia Domitilla of Terracina. An adult convert, tradition says she was baptised by Saint Peter the Apostle, and witnessed the martyrdom of Saint Paul the Apostle. Member of the Parisi family. Monk. 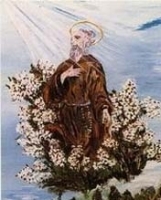 Abbot of the Vallombrosan abbey near Bologna, Italy, which after his death was renamed San Alberto. 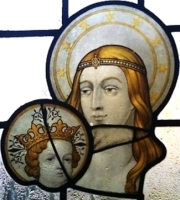 Born a princess, the daughter of King Offa of Mercia. Betrothed to Saint Ethelbert after whose death she retired to Croyland Abbey to live as a hermitess. Executioner who killed Christians until his exposure to them converted him to the faith. Martyred in the persecutions of Numerian. Bishop of Brescia, Lombardy, Italy. Converted the Lombards from Arianism. Priest. Bishop of Cagliari, Italy. Fierce defender of the faith as expressed in the Nicene Creed for which he was exiled by emperor Constantius. 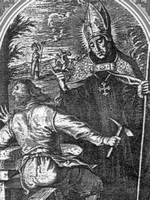 Martyred in the persecutions of Maximinus Daza. One tradition makes him the son of Alphaeus the Apostle. Martyr. 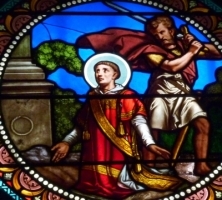 Martyred in the persecutions of Numerian. One tradition makes her the daughter of Alphaeus the Apostle. Martyr. Fourth century bishop of Toulouse, France.